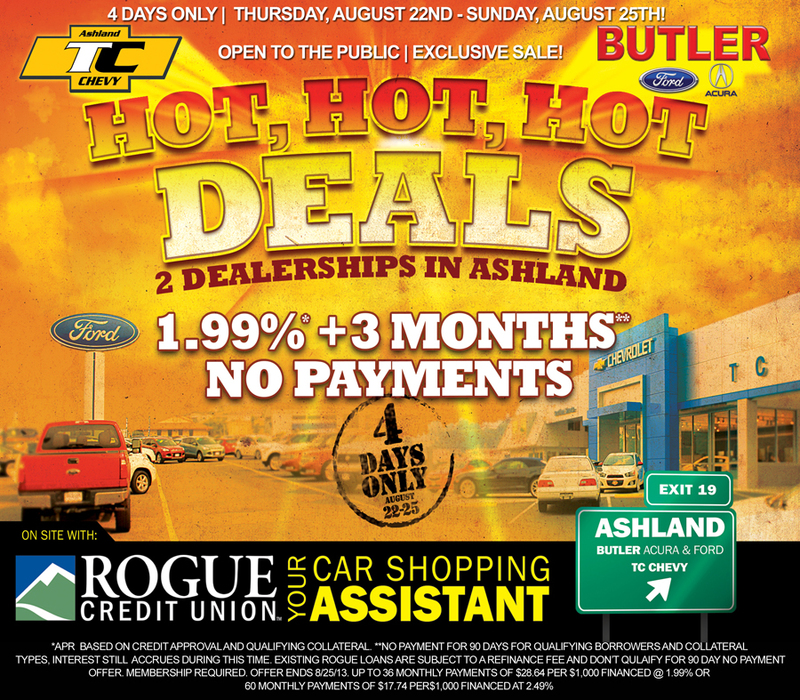 Back By Popular Demand: Butler’s Hot, Hot, Hot Sale with TC Chevy! We had so much fun the first time we joined up with TC Chevy to bring you a weekend of deals and expanded inventory that we wanted to do it again. So, this week is your chance to benefit from our second team endeavor! Our “Hot, Hot, Hot Sale” starts tomorrow, Thursday, August 22nd and runs through Sunday, August 25th. And this time we’ve partnered with a local lending institution to provide you with the best possible financing!Rogue Credit Union will be offering financing options as low as 1.99% with no payments for three months! This weekend only, at Butler Acura, Butler Ford and TC Chevy, all just off I-5 Exit 19, in Ashland.